The Nike Air Force 1 is one of the greats, but it got a little overcooked a few years back. 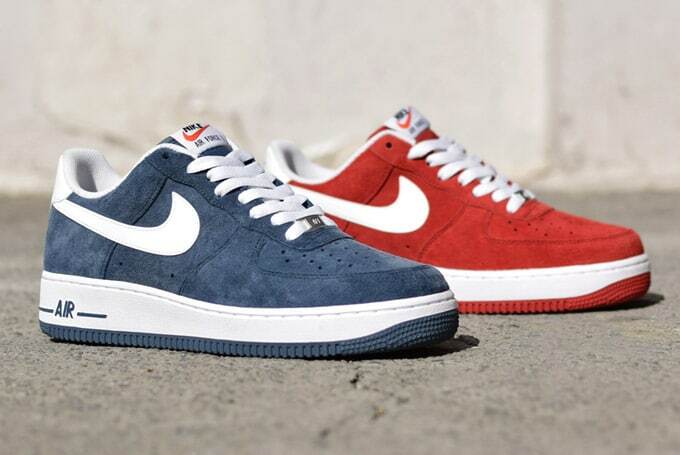 We’ve never fully understood why something so successful needed such a shove, but in 2007, the Air Force 1’s 25th anniversary celebrations, plus the shrinking state of denim seemed to tarnish this shoe’s aura a little. White tees, fitteds and Southpole jeans aren’t NYC’s core uniform right now (though forty something dudes who try to hawk their CD while you’re minding your business during a wander are still wearing that gear). The RT, Pigalle and Supreme projects, plus the A$AP-fuelled rise of the once-maligned white-on-white mid and bubbling interest in the triple white low indicate that things are changing. We still think a colourway like these suede editions might be currently homeless culturally in a world of all black, all white or avant-garde, but they’re something that we’ll always want in our cupboards — even though this shoe is in serious need of some remastering to take it back to its former glory. The slightly textured swoosh, white sole and use of colour takes things back to what made this a classic. We loved the Nike Blazer-inspired editions early last year and these are equally effective. We keep hearing people speculate about what the next hype might be, but we still don’t know what it might be — whether a full-blown resurrection is on the cards is anybody’s guess, but while these aren’t anything you haven’t seen before, they’re a neat reminder of why we’re still into them after all this time. These drop next month.